It’s been a little less than 29 years when I answered the specific and nuanced call to serve as a military Chaplain. It has always been and remains a “grace work”. Short the period of time that I was treated for leukemia from May 1992 with retirement in August 1992, and then my subsequent return to active duty in November 1994, it has been continual service. I am at 26 ½ years of service to our God, our Church and our Nation and still feel that this is what God is calling me to. It has been such a rewarding ministry and remains such a challenging place to be. I’ve been to war three times now, I would go again but hope that at my advanced age they can find someone younger. I was medically evacuated with Leukemia 21 years ago while deployed in a follow-up on operations to Desert Storm -- 14 difficult months in Iraq from January 2004 to February 2005. Most recently, I returned to Iraq to serve with the Office of Security Cooperation – Iraq, following the departure of all combat forces from December 2011 until injured and medically evacuated in late May 2012. When I was evacuated first to Landstuhl Regional Medical Center, and then further to Fort Hood (where my wife, Laura was), I was placed in a Warrior Transition Unit, due to the injury taking place in a imminent danger location. Being a Wounded Warrior remains a humbling and experience. The quality of care was exceptional and I continue to heal. One of the asides for me, is that the nature of this service will likely lead to being categorized as a disabled vet due to constant physical training, the wearing of 38 to 50 pounds of equipment in war zones and the effects of three rounds of high dose chemotherapy upon the soft tissue of my body. From the time I was in college at McKendree through seminary at Eden Theological Seminary, I had always felt that this was where God was calling me to serve. Being a son of a “Greatest Generation” World War II Marine veteran certainly predisposed me to have thoughts about this kind of service. Many doors opened quickly and dramatically to allow me to receive endorsement from The United Methodist Church and to move in this direction. We bump into chaplains all of the time, some of who serve in this setting because they either had bad experiences in the local church setting or felt it was a mismatch. Some chaplains today have never served a day in a local church setting. I remain thankful to be a part of a denomination, that has requirements, and one of those was service beyond seminary and Elders ordination. Equally thankful for each and every Sunday School teacher, youth worker/pastor (Rev. Phil Mauldin and Rev. Dennis Price hold a special place in my heart), my two pastors growing up (Dr. John Henderson and Dr. Ira Thetford) and a church that loved me and loves me still -- Main Street UMC in Alton. Without those underpinnings in the faith and parents who felt it was important for us to go through confirmation, to be in Sunday School and MYF/UMYF as well as singing in Love Eleven and Encounter, well, like the credit card commercial; it was priceless. My time as a student pastor at St. Jacob, as an associate pastor at Main Street and nearly four phenomenal years at Good Shepherd UMC in Granite City prepared me well and served as a wonderful launch pad for these past 29 years. Even the short time as a supply pastor at Wanda while I was hoping to return to active duty was exceptional! I have served in Artillery, Infantry , Air Defense and Support battalions. I have served in a large garrison/installation office where I served as a pastor of a large Protestant congregation and as a Chaplain Resource Manager . I’ve done a year of Clinical Pastoral Education in the Army to add to the unit I did at Saint Louis State Mental Hospital following seminary and as a part of my ordination requirements. 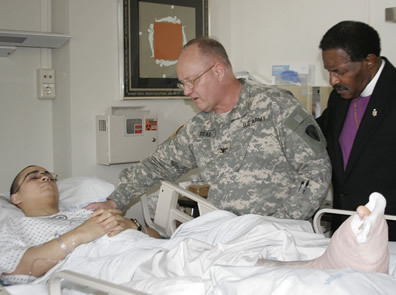 I’ve served as a senior hospital chaplain and have served as Deputy Command Chaplains at the Corps level , an Army Service Component Command Level (Europe), as the Command Chaplain for the United States Army Medical Command and at the Department of the Army level in the Office of the Chief of Chaplains, and now I serve at our schoolhouse. I have served at all levels. In the Army our two core capabilities are: to provide religious support (what we would call ministry), and to advise the Commander on all matters as religion may pertain to them. We also have three core competencies: Nurture the Living, Care for the Wounded, and Honoring the Dead. These are historically rooted and doctrinally grounded. Of significant note is that our capacity to advise often facilitates and opens the door for our religious support provision. There are many jobs at many levels where staff work (advisement) is the main effort and the religious support is provided by others. The exception being this last trip to Iraq where on most weekends I would celebrate four uniquely different services and for the first time as a Colonel, I did many of the things that I had done in the local church and in unit assignments as a Captain, while advising at the highest level, simultaneously. One thing has never changed for me, and there is no shift from the local church to my present setting. The call to ministry for me has always been and remains focused on the stories that I am placed in context with. Five quarters of CPE have helped me to inculcate and integrate this reality into my practice of ministry. How do I actively listen to the stories that I am placed in context with in a way that diminishes my story, so the focus can be on their story, and perhaps the Transcendant One can be present, too? The things I’ve seen and participated in have changed me forever. War damages the soul and the wounds are about moral injury. Many of these stories need a non-anxious care giver who will listen carefully and thoughtfully. We do our best care one story, one family at a time. The environment has become much more difficult than what I came into almost 29 years ago. There was always an expectation that we would have to function with great sensitivity in a pluralistic environment. The Chaplain Corps that I came into was primarily mainline in scope. We used to see ourselves as falling into several broad categories: Protestant, Roman Catholic, Jewish and Orthodox. That has now become Protestant, Roman Catholic, Jewish, Orthodox, Muslim, Buddhist, Hindu, Wiccan, Spiritual but not Religious and Not Spiritual/Not Religious. Constitutionally we exist to promote the free exercise of religion without promoting the establishment of religion. It has become much more difficult, not impossible but more difficult. In a unit, it is expected that we care for everyone. Unless a need, concern or problem becomes specifically religious, as in sacramental or distinctive faith group, the expectation is that we will take care of people. The phrase “Cooperation without Compromise” sums this up. I have always done a significant amount of counseling. Suffice it to say that I’ve seen things and provided care in this setting for issues and problems that I may not have seen much of in the local church setting. It has been a broadening experience for me. Ever since seminary I’ve begun my morning devotions with the same two questions: “Who is calling me? And for whose sake am I being called?” The answers have remained to same for these last 29 years. I am proud to serve in this setting and proud to be from the Illinois Great Rivers Annual Conference. “Pro Deo, et Patria” For God and Country.